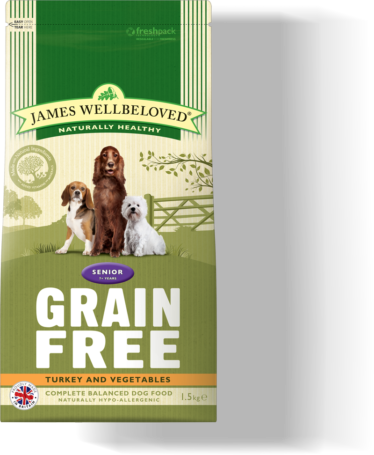 Carefully crafted and nutritionally balanced complete dry dog food for the health and wellbeing of adult dogs from 12 month to 7 years that enjoy a grain free diet. 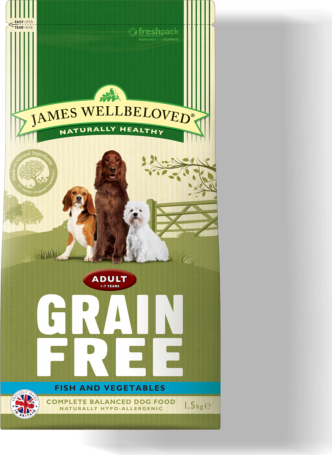 Using all our knowledge and experience, we’ve created James Wellbeloved Grain Free Fish Adult. We take a handful of ingredients from nature, one source of animal protein, vegetables and then combine them with all the vitamins and minerals your dog needs. For added peace of mind, it’s naturally hypoallergenic so less likely to cause an adverse food reaction, made without cereals such as rice and barley for those dogs that are sensitive to grains and you will never see any added artificial colours, flavours or preservatives. Not now, not ever. My German Shepherd has always had a delicate tummy. But he developed significant allergies at the later end of last year. Since then he has rated grain free fish & vegetables. And things have been greatly improved for him. Freckles just seems to prefer your dry food. My dog loves all your food helps keep him in good health and looking good. My cat likes fishy foods, with your brand preferred. Pets Pantry is my regular supplier, friendly and well informed staff, who give useful advice.